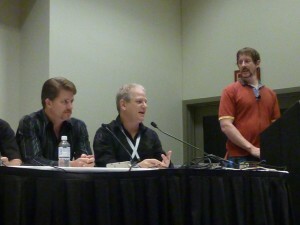 Members of this panel included Executive Producers from many successful MMOs: Jeff Hickman (EA Mythic), Jeffrey Steefel (Turbine), Lorin Jameson (Sony Online Entertainment), Nate Richardson (CCP.) This panel represents over 46 collective years experience and know-how in running MMOs – games as a service. In terms of Star Wars™: The Old Republic™ specific content from this talk – there wasn’t any. But again, as with Damion Schubert’s talk yesterday, the things that were said provide some potential perspective on what we might see in regards to TOR. One topic covered at great length, and one that never fails to cause controversy among players, was micro-transactions (MTX). Everyone on the panel was in full agreement that this model is a big part of the future of online games. There were many reasons discussed as to why, but perhaps the most interesting was that it removes a huge barrier to entry. Part of growing a player base, they said, is to get them playing the game in the first place, and a $15/month commitment is considered too much. What does this mean for TOR? Obviously this is still unknown. But given what we know so far, including the language contained in the Game Testing agreement, I’d speculate that TOR will have some form of MTX built into it. The panel did agree however that there will be certain cases or games where a subscription model makes sense. 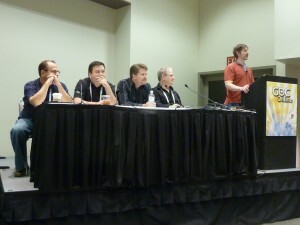 Another topic where the entire panel was unified in their stance was on the subject of the community management. Each producer regarded these roles a critical to the acquisition and retention process of MMO games. Nate Richardson from CCP stated “bring them on early.” Jeff Hickman agreed and added “my community team is a part of my dev team.” Rich Vogel echoed all of these sentiments, and while not mentioning TOR specifically, it’s clear this is the exact approach BioWare has taken to the game’s community thus far. The bottom line is that going forward, these companies are thinking of games as a service, and they want to remove as many barriers as possible to get you – and keep you – as a customer of that service in whatever form it takes. Interesting that they discussed community managers in such glowing terms but we still don’t have our new Seanberg. Unless his replacement has been officially announced and I missed it.